Peter Kenny and the Brisbane Tolkien Fellowship have some amazing events coming up this September and October to celebrate all things Tolkien. So if you’re going to be in Brisbane from September 21st to October 4th come and join them for some wonderful Hobbity fun. The Brisbane Tolkien Fellowship are a group of passionate fans who work to share their love of all things Tolkien with the community, while raising funds for children’s literacy charity The Pyjama Foundation. The Fellowship are bonded by their love for author J.R.R Tolkien’s collected works, which include classics such as The Hobbit and The Lord of the Rings Trilogy. The Fellowship regularly hosts presentations, parties and community events. 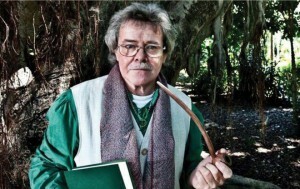 Each event brings Middle-earth to life, with costumed characters, readings and songs. This year, to celebrate international Tolkien Week, The Fellowship will be hosting a range of community events and fund raisers that will ignite the imagination of the young and old. volunteers and foster children spend time together each week, practising reading and writing skills. Our raised funds are specifically used to buy books for their library. The Brisbane Tolkien Fellowship will be celebrating Tolkien Week over a two week period. Our main reason for this decision is that the culmination of Brisbane Festival is on 27th September with River Fire. 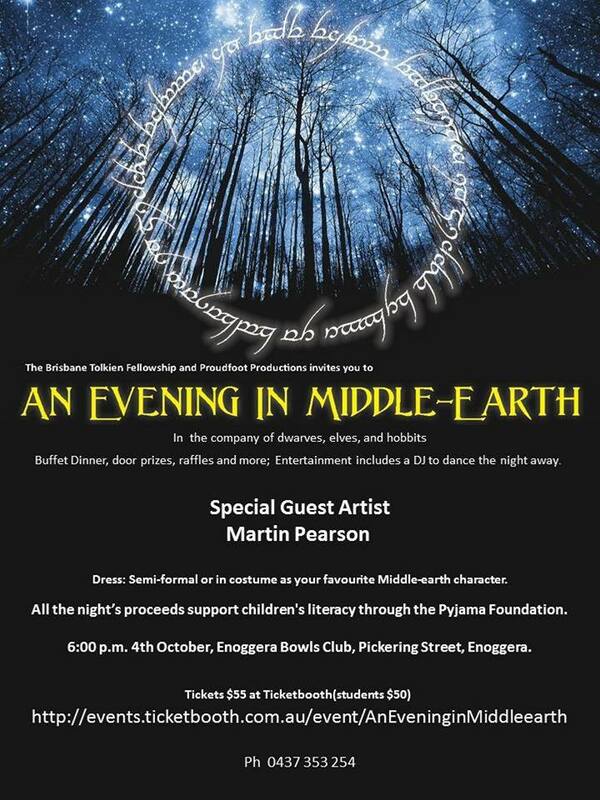 Join the Brisbane Tolkien Fellowship for an afternoon of hobbity fun with your favourite Tolkien characters to support the Pyjama Foundation. To celebrate Bilbo and Frodo’s birthdays, cake will be provided. Pack a lunch and bring the kids. This children’s event is a presentation of The Hobbit in pictures with songs and poems. This is a delightful presentation accompanied by songs and beautiful pictures from leading Tolkien artists. Aimed at younger audiences, this presentation also has been received with enthusiasm by adults who are young at heart. Have you ever seen a hobbit play barefoot bowls? Your favourite Tolkien characters are getting together for a roll. Come and play with your favourite character in an event presented by the Brisbane Tolkien Fellowship. Escape daily life and spend an evening with Special Guest Artist, Martin Pearson and his merry dwarves, elves and hobbits in a Middle-earth setting. The night includes a buffet dinner, a DJ to dance the night away, fantastic door prizes, raffles and more. All proceeds go to supporting children’s literacy through the Pyjama Foundation. Book a table and bring your friends!